Chances are the name "Ayo Kimathi" doesn't resonate the way Edward Snowden does, but the employers of both men seem to have made major errors in checking out their employees. I was alerted to this situation by right-wing blogger Jim Kouri: Link: http://www.renewamerica.com/columns/kouri who cites the extremely left-wing Southern Poverty Law Center which says that Kimathi created and maintains a web site " dedicated to advocating the killing of white people and black conservatives." Kouri notes -- citing the SPLC -- that Kimathi is "is authorized to buy weapons and ammunition for the numerous government agencies that came under the umbrella of the DHS when it was created." What the SPCL found disturbing, according to the Huffington News report, was that DHS manager Ayo Kimathi operates an inflammatory web site that features gay slurs and the murder of "whites" and the "ethnic cleansing" of "Uncle Tom race traitors," according to the Southern Poverty Law Center. 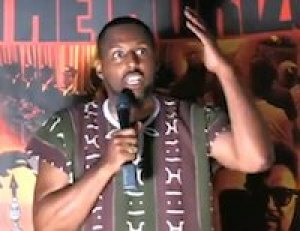 Ayo Kimathi calls himself the Internet's “Irritated Genie.” When questioned about his world wide web activities by superiors at the DHS, Kimathi replied that the web site was built as a business venture to sell videos of concerts and selected lecture, according to SPLC officials. Kouri and the other sources noted that Kimathi failed to mention some of the lectures were given by racists such as Louis Farrakhan, the leader of the Nation of Islam and close friend of President Barack Obama's former church pastor, Jeremiah Wright. However, a visit to the web site reveals the content of "Irritated Genie" which quickly warns visitors about an impending race war. His War on the Horizon, declares, “in order for Black people to survive the 21st century, we are going to have to kill a lot of whites – more than our Christian hearts can possibly count,” the Alabama-based SPLC said in its report. According to the WOH (War on the Horizon) web site, Kimathi's organization was “created for the purpose of preparing black people worldwide for an unavoidable, inevitable clash with the white race. Whites around the world are absolutely determined to exterminate Afrikan people in all corners of the earth." Kouri: "The SPLC alleges that Kimathi said he received permission for his Internet venture by DHS officials, but it appears he omitted to mention to his superiors the goal of his web site."